So Monday saw a new signing - the club splashing out on Alex Oxlade-Chamberlain. 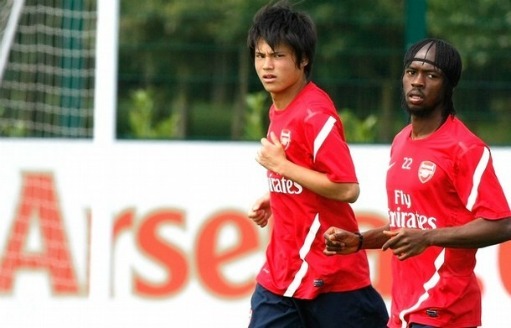 Yesterday saw the club win a work permit for Japanese teenager Ryo Miyaichi which will allow him to play first team football at the Arsenal in the forth coming season. Until the announcement, manager Arsene Wenger didn't know if he'd be able to rely on having Miyaich in the squad. But his testimony along with a supporting statement from the Japan FA helped persuade the FA to grant the 18-year-old a "special talent" work permit. Obviously the manager was quite rightly pleased for Miyaichi, who has shown promise in all the pre-season games he's been involved in. "We are absolutely delighted that Ryo has been granted a work permit. This is almost like a new signing for us, as we weren’t completely sure we would be given the authorisation. "Ryo has worked extremely hard in pre-season and performed very well during the matches in Asia, Germany and Portugal." Good to see the manager hasn't lost his sense of humour, trotting out the old chestnut: "Like a new signing". How much involvement Miyaichi will have this season remains to be seen. I'm guessing he'll be a super substitute in the Premier League, with chances to show how he can help kill off games with his pace and be a regular starter in the cup competitions. Although he's had six months in Europe, he's still to adapt to the English game and the rough and tumble of the Premier League. But I'm certainly looking forward to see him terrifying defences with his pace and quick footwork. With Miyaichi now taking a spot in the squad, alongside Oxlade-Chamberlain, it seems that we have another reason to cash in on Samir Nasri. I know neither of the teenagers has the experience of the France international, but they both can play in the wide position that Nasri operated in last season. Plus with Andrey Arshavin actually looking fit and Tomas Rosicky having a decent pre-season, I'm sure Wenger is coming to the conclusion we should cash in on Nasri. It appears that Manchester City really want him. The Daily Mirror believe a deal is almost there, with the only stumbling block being how much the FA Cup holders will put down on the table for him. It seems Arsenal are keen on £22m for the player who could leave the club for free next summer. I think I've made my position clear on this one. If they offer us that sort of money, we shouldn't hesitate in doing a deal. We'd be crazy to turn it down. Arsene Wenger said earlier in the summer we wouldn't be considered a big club if we sold Nasri and Fabregas. I would say we couldn't be considered a big club if we sold the pair and didn't adequately replace them. Nasri can be replaced. I'm not sure that Fabregas can be because there isn't another player like him. And I would much rather keep the Spaniard at the club for another season to allow players like Aaron Ramsey and Jack Wilshere to develop alongside him. And speaking of the Welshman, he's come out fighting in defence of the club. "There's no question about the ability we've got. We'll still be a force. I think we will be there or thereabouts at the end of the season. To be honest, we'd like to win everything." We've heard a lot from the media pundits who say we won't have a chance this coming season, so it's good to hear that inside the club they don't feel the same way. Marouane Chamakh yesterday spoke with L'Equipe. He discussed with them the Fabregas and Nasri issue. My friends over at Les Petites Goonerettes have the translation for you on this one. Q: Who is going to leave Arsenal? "I don’t know. I think both of them are likely to leave (Nasri and Fabregas) but I don’t know, the situation is embarrassing for the manager. I don’t think it’s a matter of money especially as it concerns Fabregas. "It’s more that Arsène is looking for his successor but can’t find him. Before he can release them, he wants to find good replacements. That’s the real problem in my opinion. The season is starting this weekend so it’s embarrassing." Now this has started to ring alarm bells with me, especially after something I was told at the AISA meeting on Monday night. The story goes that Arsene Wenger was asked to provide a list of players he'd like to sign to the board at their meetings in June and July. On both occasions he couldn't or wouldn't produce one. I haven't been able to verify how true this is, but take it as water cooler gossip if you like. But it does seem to have some logic as it looks from the outside as we've had no kind of transfer policy at all this window. It's all seemed a bit of a scatter gun approach and only since August 5 when the board held their last meeting have we started to see more movement in the market. And on that theme, it seems we're seriously gearing up to bring a defender in. The Daily Mail say we've watched Scott Dann again. This time Pat Rice and Steve Rowley had their eyes glued to the central defender as he played in a friendly match against Tottenham. Another of our targets is Phil Jagielka and his defensive partner at Everton Sylvain Distin has come out and said he thinks the 28-year-old is happy on Merseyside and doesn't want to leave. This backs up some news I was hearing last night that the Jagielka deal is simply more about money. I'd imagine we're going to see a lot more stories in the newspapers over the coming days about the defender signing, especially after what Ivan Gazidis said on Monday night. Finally, the club announced the squad for the Champions League qualifier against Udinese. It includes Cesc Fabregas, which shouldn't be a surprise. He's our captain and still under contract, even if he's not fit enough to play a competitive game of football.